Previewed at: Palace Central, Sydney, on 8 June 2018. Initially the Italian director, Paolo Virzì had no desire to work in Hollywood, saying, “I never thought that one day I would make a film in another country, in a language which isn’t mine, and I’m still wondering why it happened.” With two of his films, The First Beautiful Thing and Human Capital, nominated as the Italian entries in the Best Foreign Film Oscars, his American producers had other ideas and weren’t prepared to take ‘no’ for an answer. Virzì told them that, “if we find an idea that tickles our fancy, maybe something out of a book, and if I can work the way I’m used to working, that is, I start by writing the screenplay, then I’m ready to reconsider the idea.” But even after finding a book that appealed to him, he remained reluctant. “I remember a sort of commitment escaping from my mouth: if Donald Sutherland agrees to play the role of John and if Helen Mirren will play Ella, then I swear I will make this movie. But I was just shooting a line, covering my back, to avert the possibility of having to make this American project which my producer friends and co-scriptwriters were fanatically supporting.” When, much to his surprise, both actors agreed to come on board the director had no choice but to commit to the project and the result is The Leisure Seeker. Leaving behind their overly protective adult children Jane (Janel Maloney) and Will (Christian McKay), septuagenarians Ella and John Spencer set off on a road trip from their home in Massachusetts to visit the house of Ernest Hemingway in the Florida Keys. John, a retired literature professor, is a long-term admirer of the famous author and the journey has always been a dream of his. 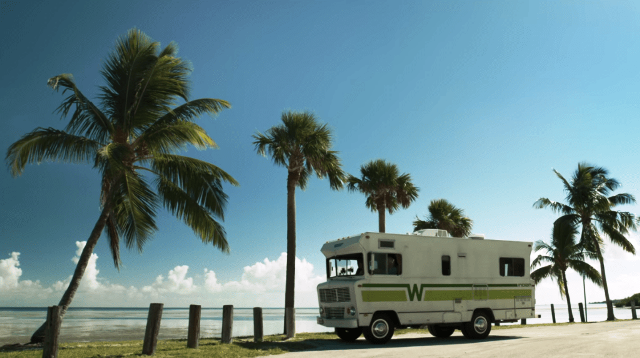 They travel in their old camper van, affectionately named The Leisure Seeker, which has been their principal form of vacationing in the many years they’ve been together. All is not quite right though: John is suffering from dementia and short-term memory loss, with only occasional bouts of lucidity, and Ella, although appearing to be in good health, is loaded up on meds and wears a wig during the day to cover her thinning hair. The couple are obviously soulmates and Ella’s occasional harshness towards John is understandable because you can sense her sorrow and frustration in coming to terms with the loss of his faculties. We witness some heartbreaking moments when he forgets not only where he is and what he is doing but, from time to time, his family and Ella as well. For the most part though, Ella tries to maintain a jolly persona, almost as a cover-up to the cruel reality of her husband’s mental state and her own deteriorating health. This wall of pretence falls apart en route, however, when a secret from their past is revealed and Ella loses her faith in everything. Sutherland’s and Mirren’s performances are excruciating to watch in places because Virzì and co.’s script doesn’t hold back in showing the harsh reality of the consequences of old age; it is very sad at times and the two veteran actors give consummate portrayals of this inevitable decline. On the downside, the screenplay verges towards being mawkish and twee on occasion. Regardless, The Leisure Seeker celebrates the fact that while spending a long time with a partner may not always be a bed of roses, it is better to have loved in life than never to have loved at all. In these increasingly bitter times, this ultimately uplifting film is a tender and moving story about the importance of living and loving together and the limits to which people will go to ensure they keep control of their own destinies. Still, I can’t help thinking that I’d rather have seen Giovanni and Isabella drive from Milan to Palermo to visit the house where Giuseppe Tomasi di Lampedusa wrote The Leopard.